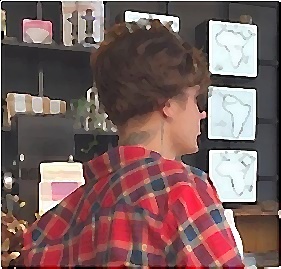 Justin Bieber chose unusual disguise when he went out for a coffee on Friday. The “Sorry” singer was sporting 70’s moustache, a goatee and windswept wig, which seemed not convincing enough because it earned more attention. He matched his weird disguise with a pair of aviators, a red and black flannel shirt, plain white tee, the chinos and espadrilles. A security guard was on the young star’s side when he asked the girls if the disguise looked real. Meanwhile, Justin has a few more dates to play in Holland before starting the UK leg of his tour.